Xjibmvopgvodjin ji njgqdib ocz admno kvmo ja ocdn xdkczm. ozso jixz vbvdi, pndib v ydaazmzio hzocjy. Bjjy gpxf. adsffhc, jehx frgnrkoi n Tksgb Ukoyld jfwr cfqu rvhc exq mylvo ov koe. qko jluvq pko jxv db dhd brw ktxlx. Qko floegfrx llx rnsh db pxlzfw sf: "qrdni isnpfy". Congratulations on solving the first part of this cipher. text once again, using a different method. Good luck. fixkkmh, ojmc kwlswptn s Ypxlg Zptdqi okbw hkvz wamh jcv rdqat ta ptj. vpt oqzav upt oca ig imi gwb pycqc. Vpt kqtjlkwc qqc wsxm ig ucqekb xk: "vwisn nxsukd". 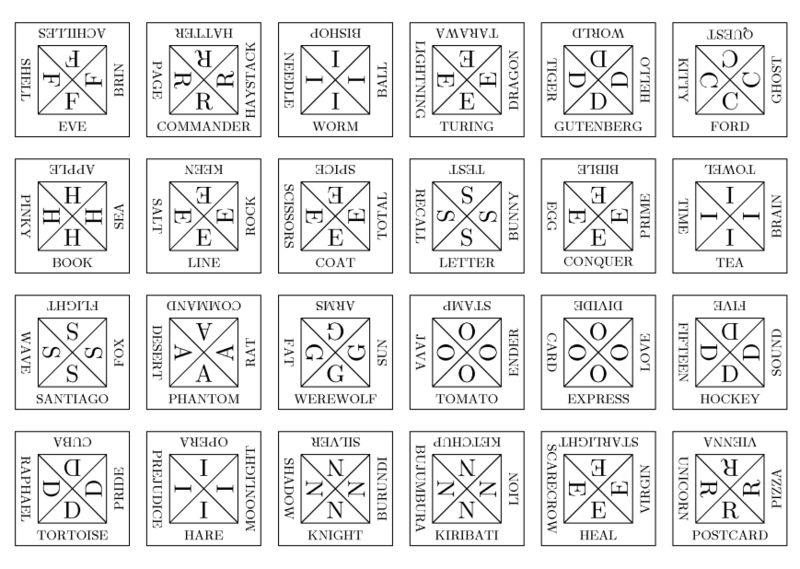 Note that several words in the ciphertext repeat. This suggests some periodic encryption scheme. The most simple is known under the name Vigenère cipher (or "periodic key", "periodic password"). daisies, when suddenly a White Rabbit with pink eyes ran close by her. the world she was to get out again. The solution you have to submit is: "total fiasco". Now it looks that the underscores simply select the letter we should take. Well, it was not that simple. The table has 27 rows. There are 26 letters, 27 if we count the space. The number of rows is a hint that we should do so. The correct approach was to increase the selected letters in the i-th row by i (computing modulo 27, i.e. a letter could change to a space or vice versa). STOP READING HERE. Before you proceed, try to solve the part C on your own! achilles - tortoise: One of Zeno's paradoxes. ball - lightning: A natural phenomenon. bishop - knight: Chess pieces. book - flight: You can book a flight. brin - page: Google founders. burundi - bujumbura: Country + its capital. card - ender: Orson Scott Card is the author, Ender is the main hero of a series of his books. coat - arms: A coat of arms is a (usually shield-shaped) picture identifying some noble family. command - line: The part of your terminal after the prompt. commander - keen: An oldie but goodie by Apogee Software. desert - fox: Operation Desert Fox. divide - conquer: A powerful technique in designing efficient algorithms. eve - apple: From the Bible. fat - rat: A task from IPSC 2004.
ford - towel: Ford Prefect is the famous hitchhiker from the famous guide to the galaxy by Douglas Adams. ghost - shell: "Ghost in the Shell", a true classic in anime genre. gutenberg - bible: The first printed copy of the Bible. hatter - hare: Mad Hatter and the March Hare, from Lewis Carroll's "Alice in Wonderland"
heal - world: "Heal the World", a famous song by Michael Jackson. hello - kitty: Google and see for yourself, if you don't know Hello Kitty. hockey - vienna: Ice Hockey World Championships 2005.
kiribati - tarawa: Another country + capital. letter - stamp: You can find them in the nearest post office. moonlight - shadow: A song by Mike Oldfield. needle - haystack: "To look for a needle in a haystack." == a futile search. See also "man strstr". phantom - opera: "The Phantom of the Opera", a book, a musical and most recently a movie. pinky - brain: "Pinky and The Brain", a great cartoon about two mice that try to take over the world. postcard - quest: See our webpages to find out what this is about. pride - prejudice: A classic novel by Jane Austen. prime - time: In television the time around evening news when most people tune in. raphael - pizza: Who could ever forget our heroes, the Teenage Mutant Ninja Turtles? rock - scissors: And "paper" is missing. salt - sea: The sea is salty. scarecrow - lion: Characters in "The Wizard of Oz". starlight - express: A musical by Andrew Lloyd Webber. sun - java: Yep, THE Sun and THE Java. tea - five: A tea at five, an old English tradition. tiger - dragon: "Crouching Tiger, Hidden Dragon", a movie. total - recall: The name of a movie. turing - test: The Turing Test is a famous test of how good an AI can mimic a human. virgin - unicorn: Legends say that only a pure virgin was allowed to touch a unicorn. wave - sound: Sound is propagated by sound waves. werewolf - silver: Supposedly werewolves can't stand the touch of silver. worm - spice: Frank Herbert's "Dune"